When it comes to working on scaffolding within an industrial or commercial setting, it is vitally important to make sure it is done with the highest standards in mind. Working in and around an industrial or commercial painting project requires working in areas that can be considered hazardous or restrictive at times. Painting contractors can be working in places such as manufacturing buildings, warehouses, natural gas facilities, piping systems, power plants, steel structures and tanks. 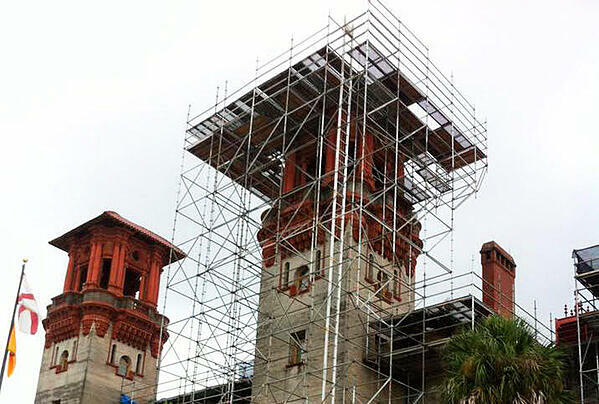 These are just a few examples of locations that scaffolding can be used. Many safety rules must be followed when using scaffolding, according to OSHA (Occupational Safety and Health Administration) regulations. These regulations are precise as to what must be done when erecting, using and taking down scaffolding systems. Even though businesses must follow OSHA guidelines, many contractors have added additional instructions for the better protection for their workers. However, we are going to focus solely on the regulations set up by OSHA. It is required that only those that possess the trained skills and knowledge be allowed to erect any structure. To avoid breakdown of your structure during your project, intense care must be taken. Setting up requires that the scaffolding is placed on a surface that has the ability to support it. This area has to be able to bear the weight of not only the scaffolding, but the additional weight of those that will be working on it. The weight of materials needs to be considered as well. When putting up the scaffolding, it's important to place a safety precaution in place in case of a fall. For this guardrails, midrails and towboards are put in place to keep the workers safe. These are to be employed when your scaffolding is ten feet or higher. Other forms of safety guards are harnesses and lifelines. Part of the set up also involves inspecting the scaffolding when erecting it. You inspect it again once it is entirely up. Inspections should only be done by a trained person that knows the OSHA regulations, and knows what to look for in case there is something incorrect. After the examination has been completed, a sticker must be placed showing that it qualifies for use. If no tag shows even if it passes inspection, the scaffolding is not to be used. Every day an examination by a qualified person is to be carried out to make sure that nothing has broken down or is missing. By doing this it helps to ensure that the painters can work safely. The inspections do not stop when the work is done either, as it is also expected when the scaffolding is being taken down as well. Many more regulations are involved when it comes to the safety of your scaffolding, and if you are thinking about setting up one for your industrial painting project, you need to know all of the rules. After all, it is the lives of those that are working on or around the scaffoldings that you hold in your hands! Dealing with scaffolding is not as easy as it might seem, and if not done correctly you could end up costing you a fair amount of money. Workers comp or legal fees can result from these safety violations. So that you do not have to deal with all of the regulations required with scaffolding on your industrial painting project, it is best to call on those that already know the rules and regulations of the trade and can get the job done right. Not only will qualified commercial painters be able to set up any scaffolding that is required, but they will be able to get the whole job done quickly and safely.